Do you suffer from indigestion, gas, constipation, or bloating? The resin Asafoetida might be for you. In Ayurveda Asafoetida (also known as Hing) is one of the best digestive aids. It can cure colic, and stagnation in the GI tract. Asafoetida is a powerful digestive agent. It is used for intestinal gas, irritable bowel syndrome, and colon issues. It can break down build up in the intestines from unprocessed food and accumulations from excessive eating of meat or junk food. In Ayurveda this is called Ama. Ama is the build up of toxins or unprocessed food and emotions that get stored in the fat cells of the body. Ama clogs the body preventing nutrients from being delivered throughout the body. Ama leads to illness and disease when left untreated in the body. Asafoetida clears out Ama through boosting your Agni. Agni in Ayurveda is our digestive and mental fire. Everything we take in from food, environmental stimulus, information, and emotions needs to be processed. Agni is the fire in which we can digest these things. Asafoetida clears out the intestinal tract by boosting Agni, which reduces Ama and keeps the body healthy. Asafoetida also gets rid of intestinal cramps and from gas and bloating. Asafoetida can also be applied externally as a paste for joints, arthritic pain, and abdominal pain. 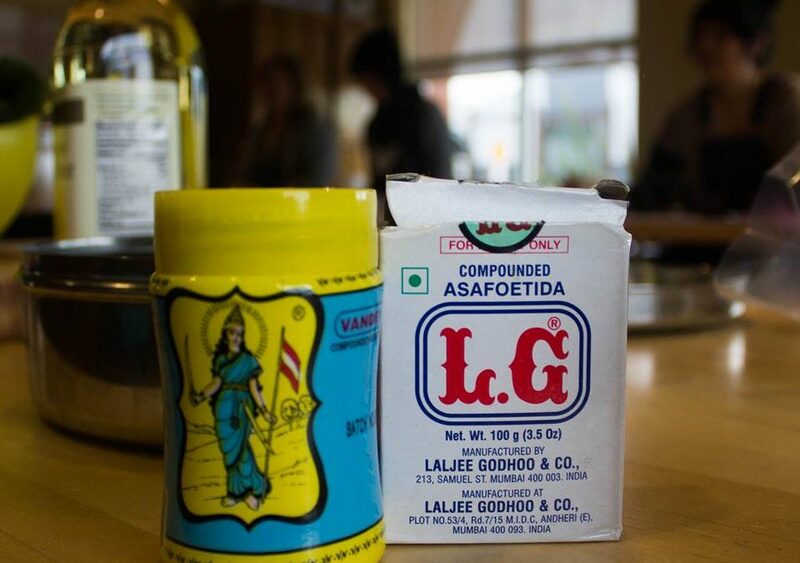 We recommend using asafoetida as a spice. We add asafoetida to bean and lentil dishes to decrease the gas caused by the food. This leaves a happier belly that won’t get pain from build up of gas while optimizing the opportunity to assimilate the nutrients in the meal. It has a strong sulfur smell and a slight bitter taste. It can also be used with other spices as a digestive agent such as ginger, cardamom, and salt. Asafoetida is used for breathing issues like bronchitis, asthma, and the flu. It has anti inflammatory, antiviral, and antibiotic effects that can help treat respiratory issues. It can also relieve chest congestion and phlegm. For menstruation it can help reduce pain, and regulate irregular menstruation and heavy blood flow. Respiratory, digestion, and menstruation pain are just a few of the benefits asafoetida has to offer. We believe it is as essential as black pepper, salt, and turmeric! Contact us at info@santacruzayurveda.com if you suffer from any of these issues and think asafoetida might be for you or if you have further questions! It can be purchased at many stores.